It should be noted that there are many variations of Onze game play. I found an old online discussion board that had a different variation from each person that commented. The Llenroc group has pretty much played the same way since Grandpa Boekman was the Onzemaster back in the 50’s. The Basic Rules set forth here will be known as the “Llenroc Onze Variant”. Set – A basic set is 3 cards of the same value. Run – A basic run is a sequence of 4 cards of the same suit. Ace can be low or high (but not both). Go Down – To lay your cards down after meeting the hand requirements. As you are going down, you can also lay off unused cards in your hand to add to the already laid down hands from the other players. Go Out – To get rid of all your cards by meeting the hand requirements and discarding all cards in your hand. When someone goes out, the hand is complete and the scores are tabulated. Splash – When a player goes down and goes out in the same turn. Offdraw – When a player takes the discarded card out of turn. Offdraw Penalty – A player must take a card from the stack when he or she takes an offdraw. One Card Penalty – When a player does not state that he or she has on card remaining in his hand, a penalty card is taken from the stack. Jokers can be played anywhere. You can even have a set or run entirely of jokers. 1st hand is 6 cards and is 2 sets (2 X 3 = 6). 2nd hand is 7 cards and is one set and one run. 3rd hand is 8 cards and is 2 runs. 4th hand is 9 cards and is 3 sets. 5th hand is 10 cards and is 2 sets and 1 run. 6th hand is 11 cards and is 2 runs and 1 set. Final hand is 12 cards and is 3 runs. Shuffle decks together (including Jokers). Select the dealer for the first hand by cutting the deck. High card is the dealer for the first hand and the player to the dealer’s left will be the dealer for the next hand. This continues throughout the game. There are seven hands, or rounds to a game. The object of the game is to get all of the hand requirement and discard all your other cards and score low or no points. The player with the lowest point total after the 7th hand is the winner. The object of each hand is to “Go Out” by meeting all of the hand requirements and then laying off or discarding all remaining cards in your hand. The cards that are remaining in your hand when someone Goes Out are counted against you and this score is added to your running total. If someone goes “Splash”, your score is doubled for that hand. 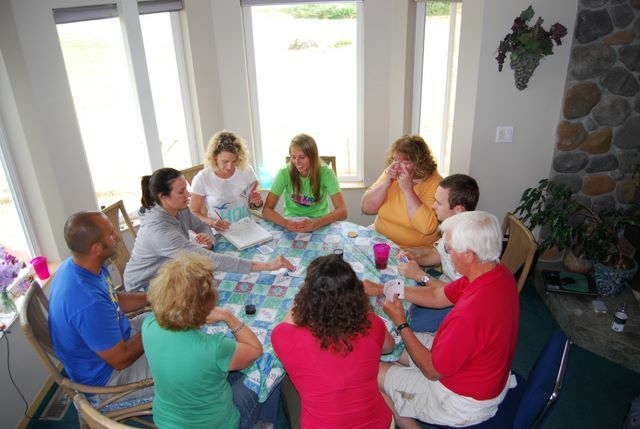 After cards are dealt, dealer places the remaining cards (the ‘stack’) in the center of the table. The dealer takes the top card of the stack and places it face up on the table. This card is available to the first player to the left of the dealer that wants it. If the first player to the left of the Dealer does not want this first card, the next player may take it. If that player doesn’t want it, it goes to the next – and so on. If no one takes this first “up” card, the first player to the left of the Dealer draws a card from the stack. The player then discards (or goes ‘down’). Play then continues with the player to his/her left. After each player discards, the card that is discarded can be picked up for use by any player. HOWEVER, the player to the left has first choice, and then the next player to the left, etc. If the first player to the left picks up the card, there is no penalty. If any other player picks up the card, there is an ‘Offdraw’ penalty. This means that the player taking the card must also take one card from the top of the stack. After a player takes an Offdraw penalty, play resumes with the player that is to the left of the discarder. When a player meets the hand requirements, he or she lays down the cards that meet the requirements. You must play only the hand requirements. If you have extra runs or sets in your hand, they are meaningless unless you can use them to play off other player’s down cards. After laying down your cards, you may then play the remaining cards in your hand on other player’s down cards. When you play on other players down cards, the cards are physically added to the down cards so that others can easily see what cards are down. If a player is able to go down and play all cards in the same turn, that is called a Splash and the hand is finished. The hand is finished when any one of the players plays all their cards. In order to go down, you must Splash, therefore, the player that goes down first wins this hand. After each hand is finished, the point values of the remaining cards in each player’s hands are added together to get the player’s score for that hand. A running total of each player’s score is made, and the player with the lowest score after the 7th hand is the winner. A special situation exists whenever a player Splashes. When that happens, the scores of the other player’s are doubled. This includes the 7th hand which must end with a Splash. Thanks for asking. The Onze rules above are hardly official, but use them if you’d like. I do not need any backlinks, but if you play Onze of any variety, please share your experiences with us here.